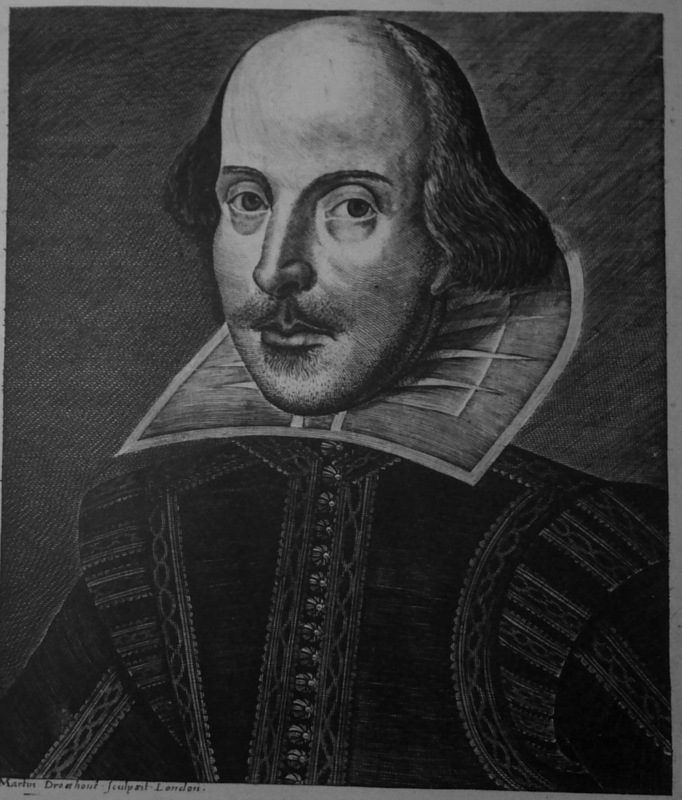 The Martin Droeshout engraving of Shakespeare that appears in the First Folio. William Shakespeare was probably born on this day – April 23 – in 1564. “Probably” because there isn’t any real certainty that this is indeed his birthday. He was baptized on April 26, 1564, a fact that has some truthful backing somewhere (in a museum or a vault, but it is widely accepted that it does exist). His birthday has been placed on April 23rd because three days was the usual waiting time between birth and baptism. Details of his life are sketchy (hence why there are so many conspiracy theories claiming he never existed), but I like to believe that he really resided on this earth, walked the streets of London in poor quality leather shoes, wading through mud and avoiding horse manure, cow manure, and human manure, on his way to the Globe Theater, his artistic home on the river Thames. For as many theories as there are claiming he didn’t live, there are just as many reasons to believe that he did. Either way, whatever anyone believes about that issue is secondary to the fact that there is a body of work attributed to this man and those plays are (arguably, but really not arguably) the greatest plays ever written/performed/studied/deplored by high school students. Shakespeare’s first collection of work, called the First Folio, was compiled by his friends Henry Condell and John Heminges and published in 1623 – seven years after his death (Interestingly enough, he also died on April 23rd, in 1616. I enjoy the dichotomy, like comedy and tragedy). This folio contained what are perhaps his best known plays – Hamlet, Romeo & Juliet, King Lear, Macbeth, and Othello. This edition was followed by three more folios (but we don’t talk about them). For as successful as he was as a business man, theater owner, and playwright, his work was – believe it or not – not completely embraced until many years after his death. He broke literary rules and didn’t stick with the conventions of tragedy or society (empowered female characters? Five acts? Absurd, sayeth the Elizabethans and Jacobeans). It wasn’t until the following century that people started to appreciate the plays that he left behind and began studying them, performing them, and basically obsessing over them. The history of Shakespeare’s plays through the years is nearly as interesting as the work itself. What are your thoughts on the Shakespeare conspiracy theories? New study reveals how Shakespeare’s actors (probably) sounded: How different was the Elizabethan accent? Well, first of all, they sounded Scottish. I’m no expert in speech development, or linguistics, or the origin of language, but I can say with some certainty that something happened over the last 400 years to change the accent (outside influence, societal influence, etc.). This is a pretty cool story, and I give lots of credit to the researchers for so painstakingly studying the sounds of words and determining the appropriate pronunciation. They did it by looking at Shakespeare’s rhyme schemes and finding anomalies with the patterns. Of the word pairs that don’t rhyme, one of those words must have been pronounced differently than the way we pronounce it today in order to create the rhyme. It would appear that the rhyme is broken with “eye” and “melody” because of the way we pronounce each word. But this is supposed to rhyme, which begs the question: was “eye” pronounced like “ee” or “ay”, or was “melody” pronounced like “melo-die”? It would seem the former (“eye” like “ee” or “ay”) makes the most sense. In that case, the rhyme is preserved. Kick off Shakespeare’s birthday weekend and check out the story here.